Theresia’s next project will be devoted to music in Vienna in Mozart’s time. The orchestra will perform Wolfgang Amadeus Mozart‘s Linz Symphony, Franz Joseph Haydn‘s Ouverture from “Il ritorno di Tobia” and Michael Haydn‘s Symphony n. 28 in C major. Indeed, a beautiful musical program that will be conducted by Alfredo Bernardini in Lodi on the 3rd of May and in Mantua the day after. “Il ritorno di Tobia” (The Return of Tobias) is an oratorio composed in 1775 by Joseph Haydn (Hob. XXI:1). The work is the first oratorio the composer wrote and the work was premiered in Vienna on 2 April 1775 with substantial musical forces, probably more than 180 performers including the orchestra, chorus and soloists. In 1784, Haydn substantially revised the work, with cuts to make numbers shorter and new choruses, for another of the Tonkünstler-Societät’s benefit concerts. It is thought that at this concert Haydn first met Wolfgang Amadeus Mozart, who became his good friend. Michael Haydn’s Symphony n.28 in C major was written in Salzburg in 1784 and was the third and last symphony published in his lifetime. Scored for 2 oboes, 2 bassoons, 2 horns, 2 trumpets, timpani and strings, it is in three movements: Allegro spiritoso, Un poco adagio and Fugato: Vivace assai. As musicologist Charles H. Sherman points out, this is the first of Michael Haydn’s symphonies to conclude with the kind of fugato “that Haydn introduced in several of his late symphonies and which so clearly forecast Mozart’s procedures in the ‘Jupiter’ Symphony.” Theresia is going to perform music by Michael Haydn for the first time: it is a remarkable addition to our repertoire, considering the important influence that Michael Haydn’s music had on Mozart. In this regard, during the preparatory stage, musicians involved in the project will have the chance to attend a lecture by Professor David Wyn Jones: stay tuned for more details about that in the next posts. Last music in program will be Symphony n. 36 “Linz” by Wolfgang Amadeus Mozart: it was written by Wolfgang Amadeus Mozart during a stopover in the Austrian town of Linz on his and his wife’s way back home to Vienna from Salzburg in late 1783. 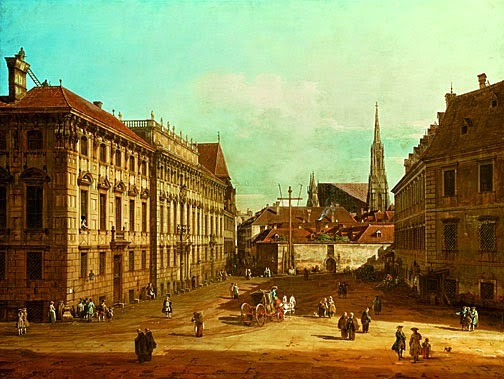 In a letter dated October 31, 1783, addressed to his father Leopold Mozart, Wolfgang writes: “On Tuesday, November 4th, I will give [a concert] in the theater here. – and because I don’t have a single symphony with me, I’m working head over heels on a new one, which must be finished by then.” Konstanze and Wolfgang Amadé had left Salzburg on the 27th of that month; Wolfgang was never again to return. Johann Joseph Anton Graf Thun invited the two travelers to stay with him; it is Thun whom we must thank for the Linz Symphony, K. 425. Despite the speed at which it was written, the work is perfectly balanced, painstakingly detailed and as rich in ideas as could be. It was played many times during the composer’s life: in Vienna, Salzburg and possibly even Prague.